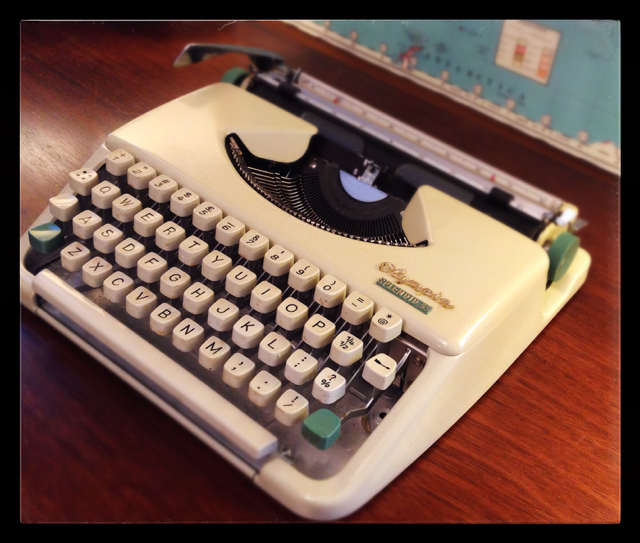 When the 1960s rolled around, Olympia had ascended to the top of the typewriter heap. While their good looks went with the disappearance of the SM3&4s, their solid mechanicals continued to shine. By the time the SM9 was introduced, Olympia had perfected the portable typewriter. It won’t win any design contests, but when you need a solid typewriter, the SM9 is any easy recommendation. The Splendid 33 stradles both these lineages. It has buttery soft lines on the outside and precise German mechanicals on the inside. This is a performer. While it looks small, it feels big. Olympia didn’t skimp on the Splendid. The key touch is light and snappy, yet doesn’t feel cheap. The bigger typewriters may have a more solid thud-thud sound to them, but when it comes to portability, the Splendid has a snap-on shell that makes it easy to stow or go. Even if you have a permanent home on your desk for the bigger machine, the Splendid makes a great second typewriter for hitting the road. While the Hermes Rocket has that cool, aqua color, the Splendid performs much better. The biggest advantage the Splendid has over the Rocket is the carriage return lever. This has always been my complaint with the Rocket, it has this stubby little thing that’s hard to catch with your fingers. Not so with the Splendid. It’s big and sticks out nicely. Plus, it has the same snap-on shell as the Rocket. Easy choice, I’d go with the Splendid. Olympia ditched the shell with the later model SF. For this size typewriter, I like the shell. It just makes a tighter, easier to handle package. Hi, just curious. How does the Olympia Splendid 33 compare to the Traveller De luxe? Which one do you prefer more. I’m looking into buying a typewriter that I can use both at home and whenever I’m out. Both have similar feel. The Traveller feels a bit bigger and you can probably find one in better condition than the Splendid. Although I prefer the look of the Splendid. So perhaps it’s a toss up, between looks and condition. They’re both fine machines. However, if you’re looking for the ultimate ultra-portable, I’d go with a later model Hermes Rocket. My Splendid 33 is in ‘as new’ condition. I also own a Traveller de Luxe, good condition, but not ‘as new’. Nevertheless the Traveller is the much better typewriter. Its more precise, less noisy and oh, so fast as an electrical. Unbelieveable how good it is. I prefer it over an Olivetti Studio 44. I like the look and the sound of the Letteras 22 and 32, but when I have to write more than a notice, I choose the Traveller. What is the difference between the Splendid and the Olympia Socialite? They look extremely similar. I’ve had both. They seem the same to me. Just be sure to get a grippy pad. These tend to wander. How much do the Olympia Splendid 33 sell for? Is the shift mechanism for the Splendid 33 a carriage shift or basket shift? Thank you. Carriage shift. But it’s not too heavy. what is the dimension of olympia splended 33? What are the major differences between the Olympia Splendid Models 33, 66, and 99? If one wanted to use one of these machines for practical typing, which model would be recommended?